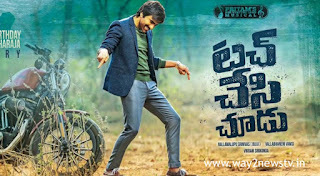 Masala Maharaja Raviteja's 'Touch and Look' movie is being planned for release soon. The film is produced by Nallamara Srinivas (Bujji) and Vallabhneeni Vamsi on the banner of Lakshmi Narasimha Productions in Baby Bharti Submission. Vikram Sirikonda, who has worked as a writer for many successful films, is directing the film through the film. Rashekhanna, Sireath Kapoor Nayaks.Producers Nallamara Srinivas (Bujji) and Vallabhaneni Vamsi said "We are planning to release our film soon and see. This week's pre-release event will be held in a grand manner. All the programs are almost complete. Each song in our film is released on social media. The recently released teaser is a Tremendous Response. Everyone is appreciating that Ravi Teja is very stylish. We are very happy to make this film with long-time friend Ravi Teja. Prominent writer Wakkantam Vamsi has produced a fabulous story for the Maharaja's image. Everybody who has seen will surely like it. "Story: Vakkanta Vamsi, Screenplay: Deepak Raj, Dialogues: Srinivas Reddy, Additional Dialogues: Ravi Reddy Malu, Keshav, Editing: Gautham Raja, Art: Ramana, Filmography: Chota.K Naidu, Producers: Nallamamara Srinivas (Bujji), Vallabhneeni Vamsi, Screenplay, Direction: Vikram Siriroda.